Officially established in 2012, the southernmost city in China has around 2,500 permanent residents, and its administrative base is on Yongxing, one of the Xisha Islands. Banks, barbecue restaurants, supermarkets, airports, cinema, library, hospitals and schools have been gradually established in Sansha. Services such as express delivery are also available, a huge contrast to the time when the city was established in 2012. Short wave radio communication for marine weather forecasts now covers all the waters administered by the city in the South China Sea and fishermen will receive warnings if severe or disastrous weather is predicted, the Beijing-based Farmers' Daily reported on April 9. In the latest progress, the first 5G base station in Sansha was launched by China Mobile on Thursday. A robot conducted an ultrasonic test under the remote supervision of a doctor in Sanya, a city more than 300 kilometers away on the main island of Hainan. Social governance in the city is also improving. 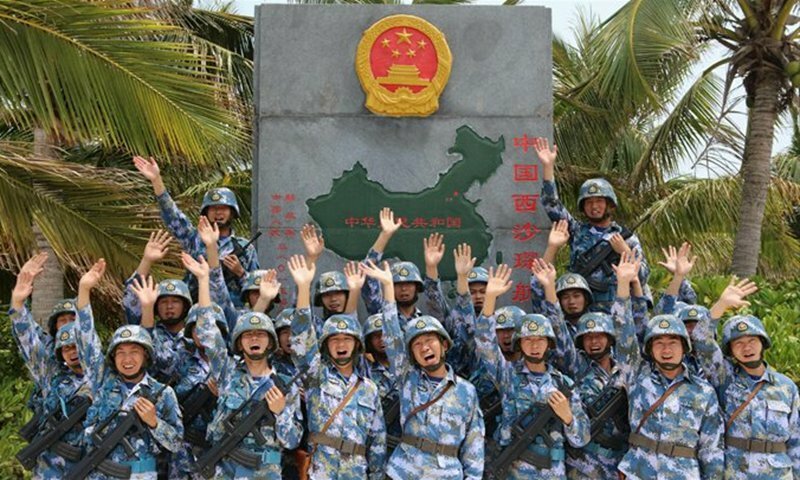 Sansha is exploring measures to establish village committees on the Nansha and Xisha islands if there are more residents on the islands, Chen Xiangmiao, a research fellow at the Hainan-based National Institute for the South China Sea, told the Global Times on Monday. As the youngest Chinese city, Sansha witnessed remarkable progress in urban construction, although it is still in the initial stage of urban development, due to the difficulty of building facilities on the island, which has high temperatures and faces tidal erosion, Chen said. Analysts also noted that efforts to promote balanced development of other islands in Sansha, as well as measures to provide more facilities to enrich people's cultural life and to build research institutions to gain more knowledge about the region are the next focus. Taking action to provide basic living facilities is the current priority for Sansha, said Liu Feng, director of a research center on the Philippines under Hainan Normal University. Measures to facilitate economic activities, such as expanding port and dock facilities, as well as efforts to follow Hainan's position as a free trade zone, will be the next focus, Liu said. Public services such as lighthouses and marine information sharing and rescue services are already open to foreign countries, and the city could also step up the process to open to international visitors in the future, Liu told the Global Times on Monday. Sansha administers the Xisha Isalnds, Zhongsha Islands and Nansha Islands and their surrounding waters in the South China Sea. As it administers some of the disputed islands in the region, it is regarded as a "bridgehead" for China's marine rights and interests in the South China Sea. It is notable that unstable factors in the region have been making waves recently and it is highly likely that the waters could face escalated tensions in 2019, analysts said. Commentaries, like one published by Reuters on Friday, claim that China goes "unconventional in escalating South China Sea face-off." Reports speculating escalating China-US tensions in the region have been frequently published since early April. Politicians in the Philippines also urged the Duterte administration to implement a 2016 Hague ruling "once and for all," Philippine-based GMA News Online reported. As midterm elections in the Philippines approach, the opposition is likely to promote a tougher stance on China as a campaign strategy, inciting nationalism to woo voters and coerce the Duterte administration to make tougher moves, Chen said. Despite all the uncertainties, bilateral and multilateral efforts to maintain peace in the region have not been shelved, which analysts said provided more confidence that the disputes and conflicts can be "managed." China and the Philippines convened the Fourth Meeting of the Bilateral Consultation Mechanism (BCM) on the South China Sea on April 3 in Manila. A statement released after the meeting stressed the bilateral consent to maintain the positive momentum of negotiations toward the early conclusion of a Code of Conduct (COC). The two countries also discussed how to enhance maritime cooperation and exchanged views on oil and gas development at the meeting. There is a positive momentum for diplomatic interactions and maritime exchanges between China, Malaysia and Vietnam. Governmental, military and think tank exchanges are held between China and the US to reduce misjudgments, Chen said. Under the framework of a COC, unilateral actions that could escalate tensions are restricted and crisis management systems will effectively prevent conflicts among the countries in the region, Chen told the Global Times. The South China Sea is a peaceful place, Chinese Foreign Ministry spokesperson Lu Kang said at a daily routine press conference on Friday, urging countries outside the region to refrain from "stirring up trouble in the calm waters" of the South China Sea.